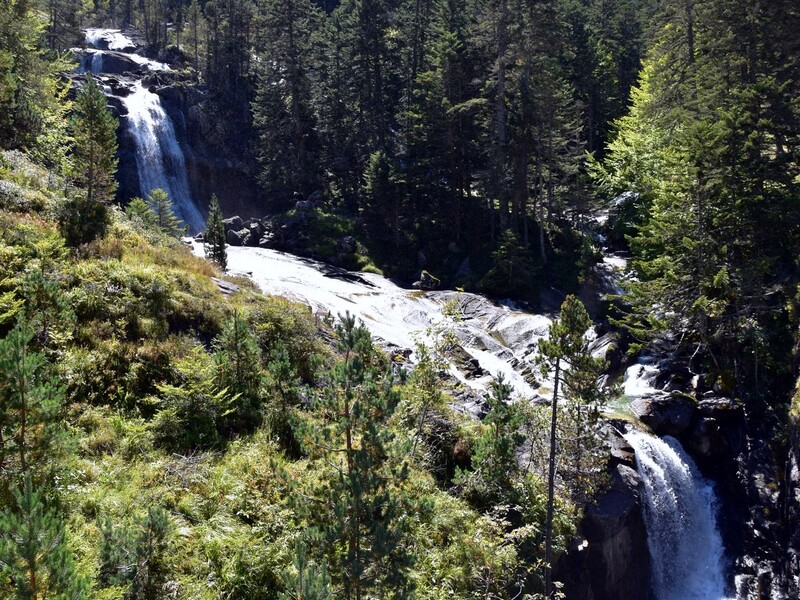 Hiking to the Lac de Gaube is a lovely stroll along well-kept tracks with beautiful waterfalls everywhere. 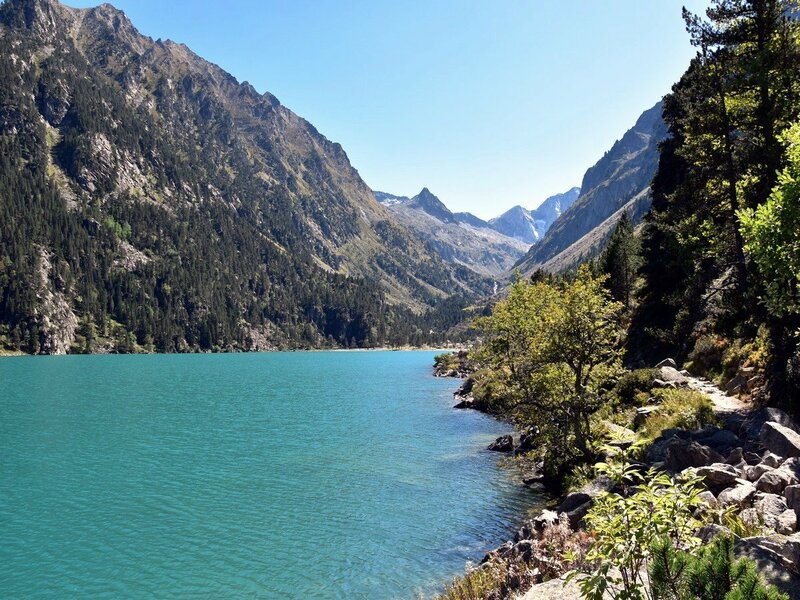 The goal is Lac de Gaube though, one of the most beautiful lakes of the Pyrenees. This is definitely one of the most scenic hikes of the entire region, no wonder it is so popular! The Pont d'Espagne is well signposted from the town of Cauterets. There is an immense car park at the starting point and has a EUR 6.50 minimum fee. 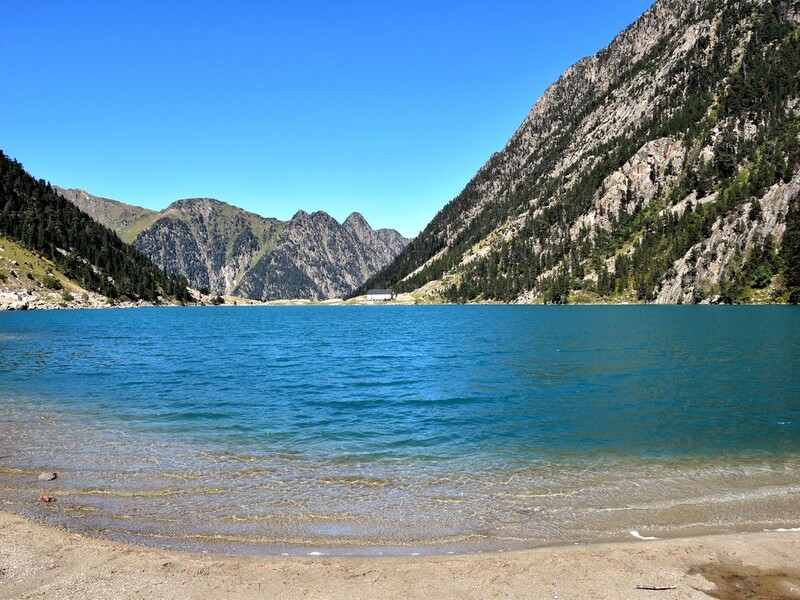 Hiking to Lac de Gaube is a real treat, and a hike that you can take your kids with you. The arrival at the Pont d’Espagne is somehow surprising at first: a huge car park with a large building at the end of it, and a small cable-car leading to a chairlift. But do not worry: this will not prevent you from enjoying the natural, hidden beauties of this valley. From the parking lot hike west out. You pass a building as you follow the main track that leads uphill. Turn right on a good path, crossing a little stream with a small waterfall to your left. Just a few metres further, a bridge crosses a gorge, with a view over bigger waterfalls. Take the dead-end path to the left after the bridge. 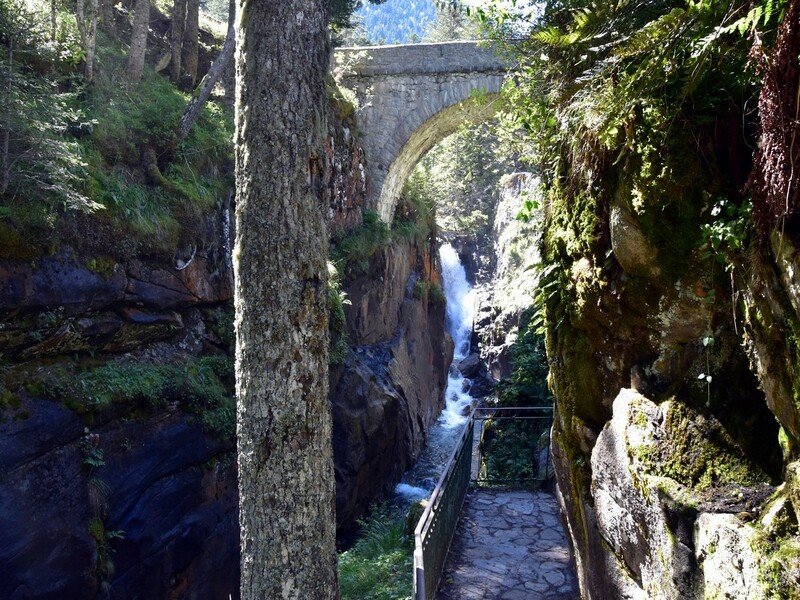 From there, you can see a bigger, stone bridge with another waterfall further upstream: this is the Pont d’Espagne. The name comes from the fact that there used to be a track leading to Spain going through this valley. Make your way back along the dead-end path and climb up the paved path to the left. You will soon arrive at the Hôtellerie du Pont d’Espagne, which stands right in front of an incredible series of large waterfalls, at the meeting of two powerful streams. Take the time to hang around to admire the numerous waterfalls, then cross the main bridge, walk a few metres downhill and pick the path which starts a bit further to the right. 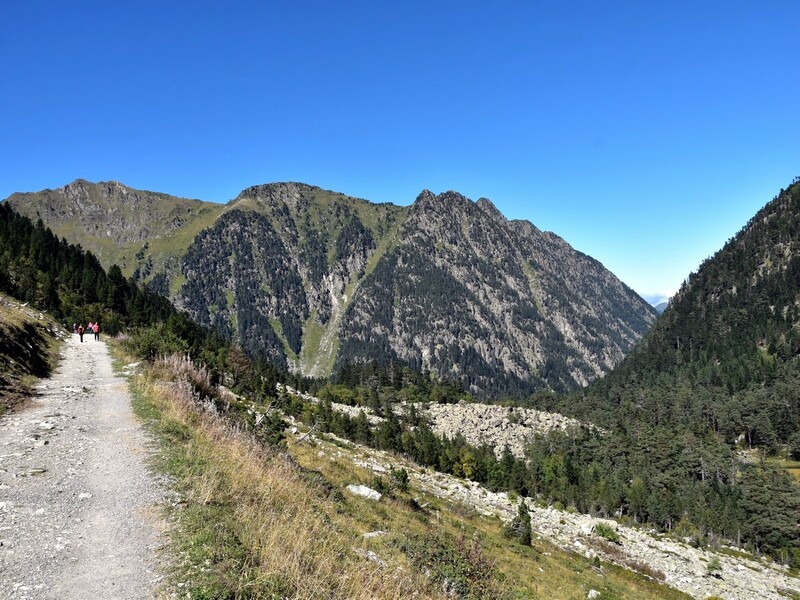 This path is part of the GR10 (red and white markings), a long-distance footpath that leads from the Atlantic to the Mediterranean winding through the Pyrenees. 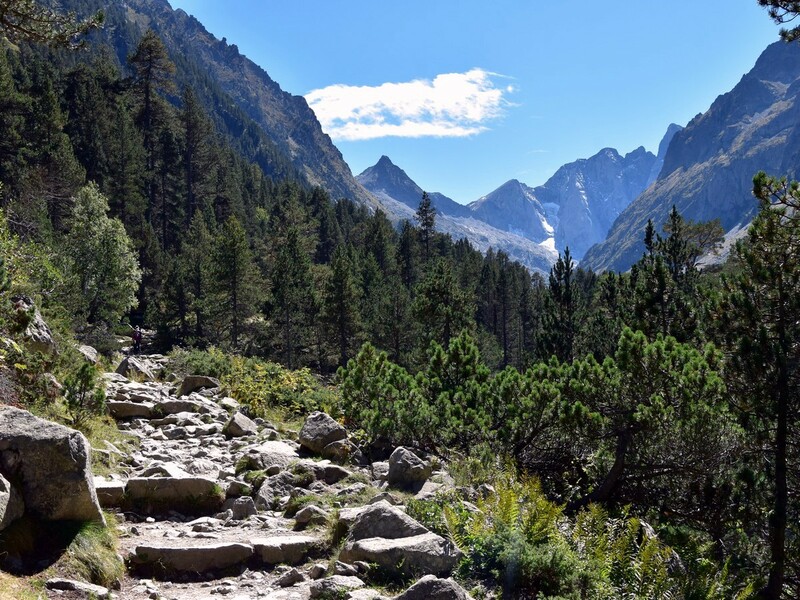 This path will lead you up to the Lac de Gaube. The going is rather steep at the beginning, but the path is in good condition and crosses a beautiful forest, with big rocks and deep green ferns, passing close to one of the main waterfalls. Soon, the path levels and you are rewarded with stunning views towards the end of the valley, with the Vignemale (3298m) and its glaciers now visible. On the other side of the valley, you will probably spot some walkers on a track; this will be our downhill route. After a few more efforts, you will reach the beautiful Lac de Gaube. The arrival at the lake is kind of surprising as you cannot see it before you really get there! This is a great spot for a picnic, or you can enjoy a drink at the Hôtellerie du Lac de Gaube, the only building by the lakeside. Take the time to try and spot tiny fishes swimming in shallow water or birds of prey hovering over the surrounding ridges. From there, cross the small bridge which passes over the stream coming out of the lake, turn left, and it is an easy, 25-30-minute return walk along the right (west) side of the lake. 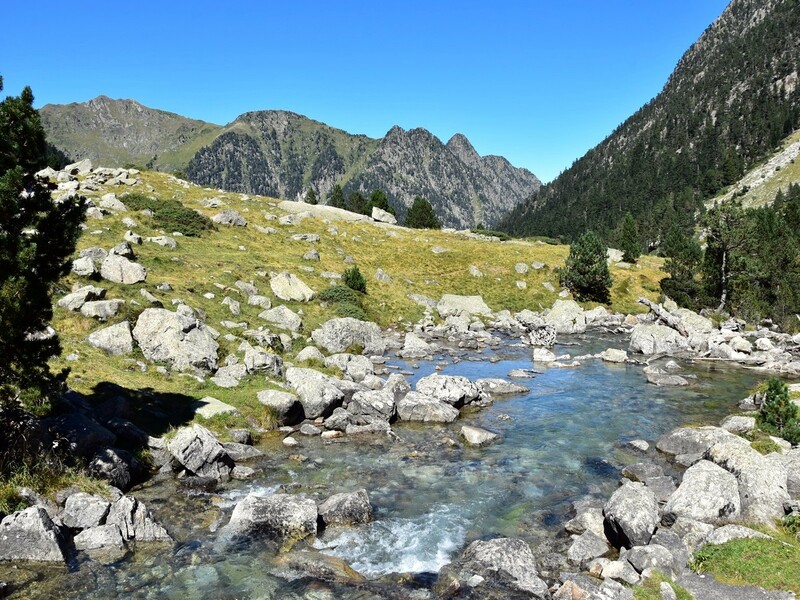 This path takes you to the southern end of Lac de Gaube, where more views await. Retrace your steps along the lake and pick the main track which goes slightly uphill to the left of the bridge. Follow this track for about 1.5km until you reach the chairlift. Take a look from the belvedere just left of the chairlift, before getting back on the main track, taking the sharp bend downhill. The track zigzags down quite steeply in places but is very wide and rather easy-going. 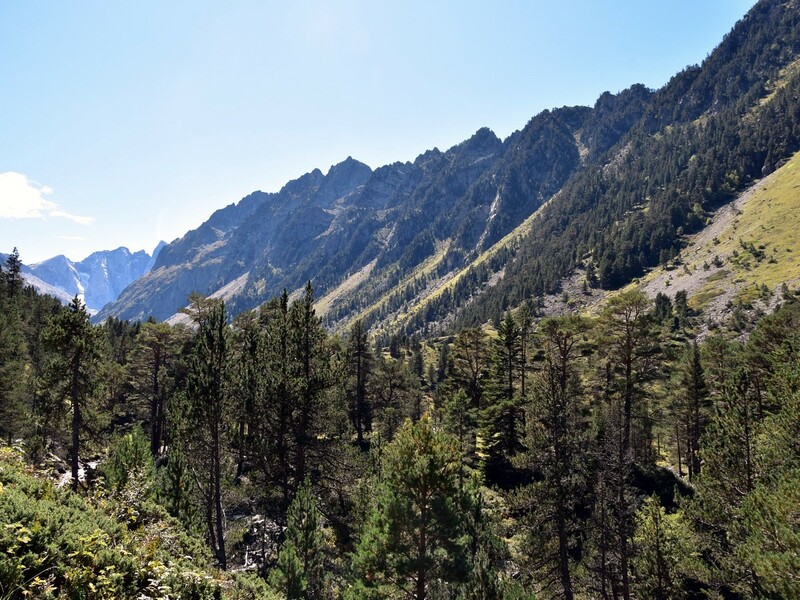 As you reach the valley floor, you will see a building to your left – walk straight in front of the building, cross the bridge in front of you and take the path immediately to the right, which will lead you down to the Hôtellerie of the Pont d’Espagne. Take a last look at those amazing waterfalls before retracing your steps down to the car park by way of ascent. Bivvy is forbidden in the National Park. The best option is to choose among the large choice of campsites at Cauterets, or stay in one of the refuges. You can stop at the Hôtellerie du Pont d'Espagne (near the main waterfall) or at the Hôtellerie du Lac de Gaube (near the lake) for a snack and/or drink. This walk could be done with relatively young children, but if the amount of ascent seems too much, you can also use the chairlifts, which take you to a belvedere at roughly 1750m. From there, it is an easy stroll (less than 3.0km return, with hardly any climbing) along a good track down to the lake (this is the track used for the return trip -see GPS file). 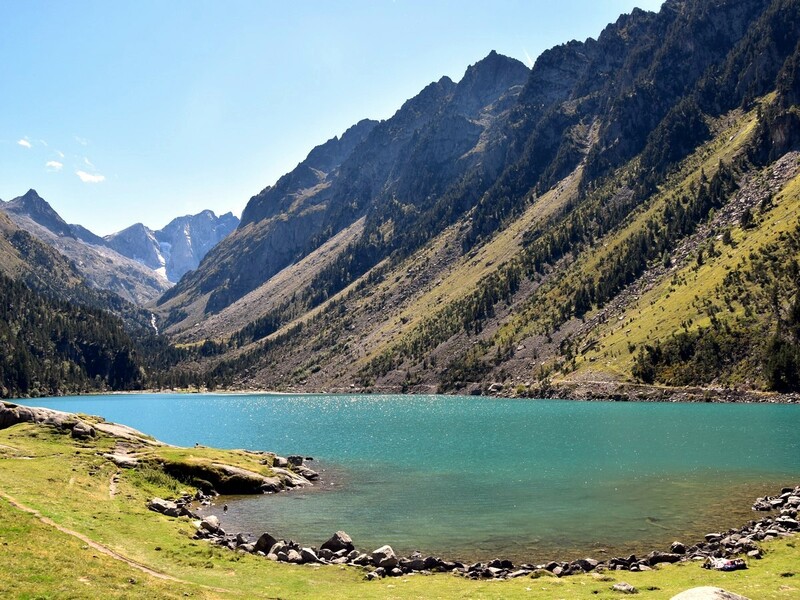 The Lac de Gaube is one of the main access points to the Vignemale, the highest peak of the French Pyrenees at 3298m. Its ascent is only destined for extremely fit and experienced mountaineers, as the use of crampons, ice axe and ropes is mandatory. An easier option could be the ascent of the Petit Vignemale (3032m), which does not require any special equipment in normal summer conditions. Note that both of these expeditions would require a two-day trip. 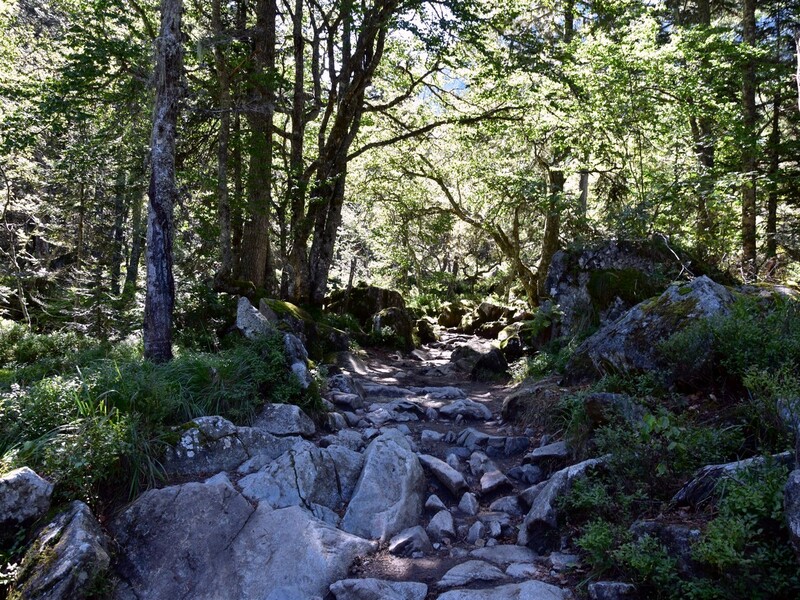 If you have time for another easy walk, you may want to go and explore the beautiful Vallée du Marcadau. Just follow the main river W of the Pont d'Espagne on one side, cross one of the bridges and head back along the other bank. There are various options of distance, from 2.0km to 7.0km return (from the Pont d'Espagne), with a maximum of 150m climbing for the longest (via the Pont du Cayan).